A lot has been going on in the last six weeks since out apartment has been taken OVER by our kitchen rehab. With the Living Room / Dining Room being the staging area, the kitchen torn to shreds, our guest bedroom / office being our kitchen. That means we have been living in our bedroom. It’s kind of like being back in a college dorm w/o the cheap white wine. I got to escape the madness for a few days in mid March to go to Seattle on business. I got to meet up with the awesome ladies from Knot Another Hat. It was great to hang with them, and Seattle was beautiful, although we hardly got to leave the hotel. After a short biz getaway, it was back to the construction zone. We’ve had more then a few glitches along the way, and a few things that have put us SEVERAL weeks, behind, but it’s looking pretty good so far. Our favorite feature so far is the cork floor. It came out really nice. As long as we were ordering the granite for our counter tops, we decided to demo the hearth and get a piece of granite for our new hearth stone. I can’t wait for Wednesday when the install happens. I finished the Mini Cardi to wear to the YMN conference in Seattle. It only took me two days. It’s a really fast knit. I still haven’t chosen the buttons yet, but it’s cute without buttons. I also cast on Hey Teach in the Recycled Cotton. It was a really fast knit (especially since I did the 8″ of stockinette on the Studio’s knitting machine. I have a four day weekend and it was in the 70s today, so I decided it was time to clean up the garden. We are a bit behind this year in getting things together, but I thought I could get started. I finished my swatch for the new Stripe Class I’m teaching and took it upstairs to the deck to dry. The sun was so hot up there, it was dry in a few minutes! and FINALLY our little Forsythia plant actually bloomed. We have picked up our free Forsythia clipping at the Brooklyn Botanic Garden Forsythia Member Day for three years, and we finally got a non dud clipping! Tomorrow, plant the Dahlias, the Cannas and finish Hey Teach. Hopefully I can get the earthboxes set up soon. Let the Rehab Begin . . . I think I’ll be enjoying some serious take out! 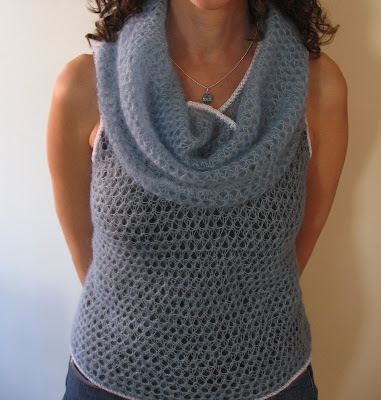 I did finally finish the crochet edging and cowl on the Weekend Knitting Cami & Cowl. I also have almost finished David’s sweater back. I feel like I’m not going to make it with the yarn I have, so I did order more, but of course, it’s a different dye lot. It’s a bit lighter, so I’m going to use it for the ribbing for the front & arms, and for the collar.